If you know nothing else about the cheetah, you should know this: We have lost more than 90 percent of the world’s population of wild cheetahs in the last 100 years. Most people I share that fact with are startled to learn it. 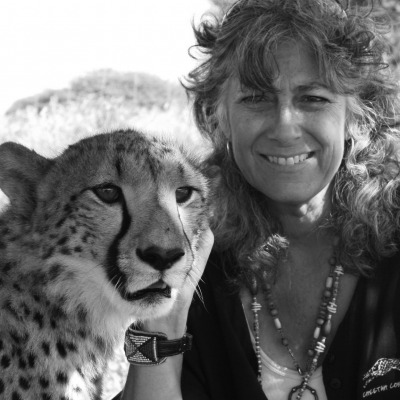 Many people don’t even know that the cheetah, the world’s icon of speed, is actually racing against extinction. And it’s a race that the cheetah will lose without our help. The biggest threat to the cheetah is no surprise. It’s us. Humans. Our Okakarara Ambassador Cheetahs came to us when they were just three weeks old, after their mother was killed by a local farmer. They will never go back into the wild, like many of the other orphan cheetahs that we care for here in Namibia. We are currently caring for 49 cheetahs, but every cheetah that can go back into the wild does! Most cheetahs in the wild do not live in protected game reserves. They live outside reserves, alongside human communities. This is why our community work in developing strategies for human wildlife conflict resolution is so important. These communities are comprised of livestock farmers, who raise cattle, goats and sheep. Many are poor, and can’t afford to lose even a single animal if they want to sustain themselves and their families. When farmers believe that cheetahs are killing their livestock, they see killing cheetahs as the only solution. For nearly 25 years, we at CCF have been working at our headquarters in Namibia to provide alternative solutions to protect livestock, and in so doing, protect cheetahs. One of our very successful programs is our Livestock Guarding Dogs. We breed Anatolian shepherds and Kangal dogs, a Turkish breed that has been used for thousands of years to protect livestock from wolves and bears. Since 1994, we have bred and placed more than 450 of these dogs with Namibian farmers. The puppies grow up with livestock and are very protective. Their ferocious bark is intimidating and keeps predators like cheetahs away from flocks. The dogs are incredibly effective. Farmers using a CCF dog see their livestock loss drop by 80 to 100 percent. We have a two-year waiting list of farmers to get one of our dogs to guard their herds. This year was a banner year for CCF as we placed five litters of puppies with farmers to protect livestock and cheetahs! After the puppies are placed with farmers we check on them regularly assuring their health and well-being, and that the dogs have settled into their new job — protecting herds and securing a future for the cheetah. Just this past month, we sent four puppies to Tanzania to start a new Livestock Guarding Dog program there with one of our partner organizations, making Tanzania the fourth country in Africa where we’ve expanded the use of our Livestock Guarding Dogs as a solution to help farmers live with cheetahs and other predators. In October, we welcomed a delegation from the European Union’s Intergroup for Animal Welfare and Conservation (IAWC), who were interested in learning more about our dogs, and about all the other things that we’re doing to support rural Namibian farmers, like our livelihood development programs that teach farmers to manage their herds better through animal husbandry and veld management. We also help farmers realize alternative income streams, like using goat’s milk to make cheese. Our research shows that our approach to conservation really does change attitudes. One of our recently published studies shows that where farmers are educated as to the economic value of predators, they are more tolerant of them, and less likely to harm them. What we’ve learned after nearly 25 years living alongside farmers, and operating a model farm ourselves, is that helping people is the key to saving the cheetah. The state of the cheetah in 2013 is still dire. The cheetah is still the most endangered big cat in Africa. But there is hope. Over the past two decades, we’ve done the research and put into practice real solutions that address the forces that threaten the cheetah’s survival. We’ve managed to stabilize Namibia’s cheetah population which is the largest population in the wild. But cheetahs elsewhere face a more uncertain future. The state of the cheetah in 2013 is that we stand at the threshold. We have accomplished so much in nearly 25 years since CCF started. We’re committed over the next 25 years to expanding our reach, exporting our solutions, and helping the cheetah win its race against extinction not just in Namibia, but everywhere. It’s International Cheetah Day, a day to share our message far and wide, that the cheetah needs all our help. I hope you’ll join me by sharing what you know with others, whether it’s at the dinner table or on social media. More importantly, I hope you commit yourself to working with us, not just today, but every day. The race is on to save the cheetah, and with your help, we can win it.